I have stood in stores in Switzerland and held cat-skin-fur blankets dog-skin-fur overcoats and cat-skin-fur overcoats. The Swiss dog and cat meat trade and fur-skin trade does exist, with the Rottweiler dog being the favorite dog to eat. Dog farmers admitted that many of the dogs were bludgeoned to death, and some were shot. Farmers in the Appenzell and St.Gallen areas regularly slaughter dogs and cats because they enjoy the flavor of dog and cat meat, which is particularly popular in the Rhine Valley. Dog meat is used to make sausages, casseroles known as Mostbröckli, and a fatty remedy for rheumatism. Cats are often cooked with wine and garlic at Christmas time, in the same style as rabbit. This is especially popular around Bern, Jura and Lucerne. Swiss cat-skin-fur is falsely believed to cure rheumatism, even though there is no scientific proof to back up these claims. Switzerland’s cat-skin-fur trade was so out of control that laws were passed in 2013 to try and curb the sale of cat fur. It is falsely believed that cat-skin-fur cures rheumatism, even though there is no scientific proof to back up these claims. Cat butchers said they prefer cats to be 6 years old, with a full thick pelt. They brutally strangle the cats because its less damaging to the fur pelt. Cat butchers described their method of slaughter: they sling a noose around the cat’s neck and hang the cat from a beam until it stops thrashing, then immediately peel it’s skin off – even if the cat is still alive. 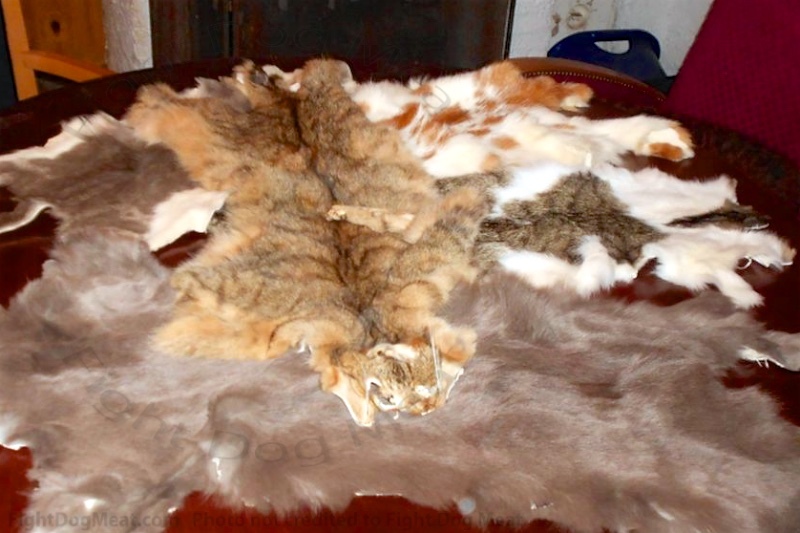 Switzerland need to enforce their laws and stamp out the cat-skin-fur trade because not enforcing the law has accelerated prices for cat-skin-fur blankets. In 1993 the Swiss parliament rejected changing laws to protect dogs and cats against human consumption. The Swiss Veterinary Office sided with Swiss dog meat butchers, justifying the practice of eating dogs and cats. The Veterinary Office falsely stated that countries use specially bred dog s for meat purposes, which is a fraudulent myth. When you travel to Switzerland as a tourist and admire the beautiful wooden barns nestled in the mountains, you may well be driving past a dog meat farm! Having seen Switzerland’s fur-skin trade with my own eyes, and the large barns where dogs and cat are kept, I have a very strong interest in what is happening to Switzerland’s animals and will continue monitor the situation. WE HIGHLY RECOMMEND the Vietnam Animal Welfare Organization (VAWO), who save dog meat dogs and cats and run a Vet Training School to teach local vets humane practice on pets within Vietnam. Many local Vietnamese vets do NOT USE ANESTHETIC ON DOGS OR CATS DURING OPEN SURGERY! The World must stop animal cruelty, abuse, exploitation and slavery. This is absolutely wrong, is insane, they share the planet with us, we are not the owners!